One nap or no nap? Nightmare or night terrors? Crib or toddler bed? Toddlerland can be tricky and they are master negotiators! We have tried & true ways to keep your little one in their room and sleeping peacefully all night. 24 Months to 5 years old. + Review your client history form in detail and get to know one another! + By the end of our consultation, you will be prepared to implement your custom Sleep Plan, while being completely comfortable with the techniques for assisting & coaching your child to sleep to put themselves to sleep at bed/naptime, and back to sleep during any night wakings or sleep regressions! 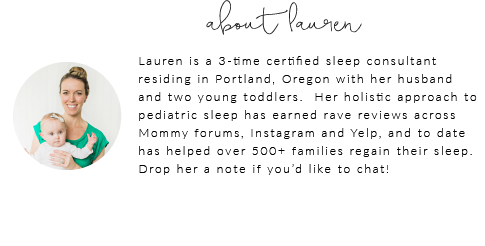 For clients interested in one area of assistance regarding sleep (daycare sleep, sleep regression help, nightmares, new sibling, etc.) with a child that sleeps fairly well already at night/naps who has developed a minor sleep issue. You will receive a verbal sleep action plan, however no support is included. This package is available as a 30-minute phone call with one follow up email to use down the road at your discretion. For children 0-5 Years Old. In-Home Package: $300 combined with any package above*. *Subject to availability, within the Portland, OR area.